Community members transport supplies for infection protection and control kits to their village in Grand Bassa County on the River Gee. Nearly 100 tons of supplies to fight the deadly Ebola virus that arrived last week on a 747 cargo jet chartered and stocked by Samaritan’s Purse are being distributed in Liberia. The airlift departed from Charlotte on Wednesday, Oct.1. It landed in Monrovia early the next afternoon Liberia time. The plane was greeted on arrival by Liberian Vice President Joseph Boakai, who, at the invitation of Franklin Graham, toured Samaritan’s Purse international headquarters in Boone, N.C., in 2012. 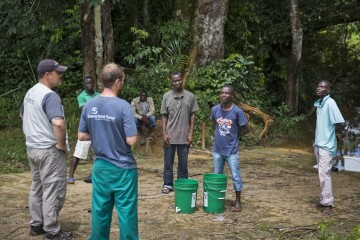 Samaritan’s Purse staff members Nathan Glancy and John Troke take infection protection and control kits to a village in Grand Bassa county affected by Ebola. The shipment was immediately unloaded and warehoused. Samaritan’s Purse staff members have begun distribution of the supplies. Franklin Graham and Jeremiah C. Sulunteh, Liberia’s Ambassador to the United States, were among those who attended a special send-off ceremony for the airlift of supplies to help stop the spread of the terrible virus, which has claimed over 3,800 lives in West Africa, including more than 2,200 in Liberia alone. Ambassador Sulunteh expressed gratitude for the supplies. 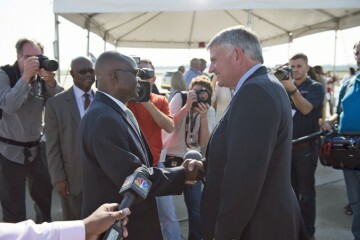 Franklin Graham meets Jeremiah C. Sulunteh, Liberia’s Ambassador to the United States. Franklin Graham prayed that God will use the supplies, and the work of Samaritan’s Purse in Liberia, to bring healing to many. “I want to ask my friend Franklin Graham to join me on the podium as I pin him as an honorary citizen of Liberia—in the name of the Father, the Son, and the blessed Holy Spirit,” he said. Materials for IPC kits are loaded at a warehouse donated by the Firestone rubber plantation. The flight signals a new strategy for Samaritan’s Purse as we continue the battle against the unprecedented outbreak. In remote areas of the country Samaritan’s Purse will train Liberians to run 10-bed facilities that provide basic supportive care. Our national and international staff will manage operations. A NEW EFFORT TO STOP EBOLA: Our multi-faceted approach will focus on establishing Community Care Centers and providing public health education. Four large tents to be used in the set up of these facilities were onboard the 747, which represents just the beginning of the work as Samaritan’s Purse is prepared to build and manage up to 15 Community Care Centers in rural areas across the country. Tents for housing Community Care Centers are among the supplies now warehoused in Liberia. 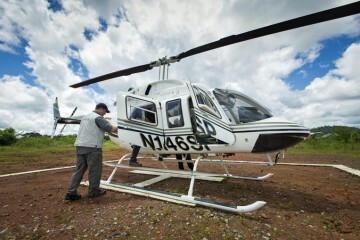 A Samaritan’s Purse helicopter took staff to meet with officials about putting a Community Care Center in Zorzor District. Samaritan’s Purse efforts to combat Ebola are designed to protect the safety of children like this boy living near ELWA hospital.